Paper Cutter Jogging Blocks help align your stack of paper to ensure a precise square cut. 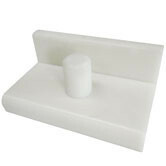 Our jogging blocks are made of heavy duty KIMOPLASTIC in a perfect 90 degree angle. These jogging blocks slide easily and have a strong magnetic base to help jog bottom sheets. Our Plastic Jogger Blocks are made in the USA and have rounded handles to fit comfortably in your hand. We offer a variety of jogging block sizes to aid you in aligning paper for your automatic and manual paper cutters.